I’ve visited nearly all continents of this wonderful planet – and all that exploring has taken me well out of my comfort zone by being confronted with cultures and languages that were completely foreign to me. Someone once told me that life starts at the end of my comfort zone. Those learning experiences and opportunities for personal growth are much more powerful when I’m further out of my comfort zone, and no longer surrounded by the things I’m used to: whether it’s people speaking the same language, or the same kind of stores. Remove anything familiar, and the opportunities for personal growth are amplified tenfold. Most reasons people have to not travel are just excuses, that keep us trapped in circumstances that we think are comfortable. It’s nice to stay inside the boundaries of that comfort zone, whatever we make it out to be. Blaming something external like a job, life partner or the kids is a convenient way to avoid taking full responsibility for our own life, and having to question those “comforts” too much for comfort. Fear of traveling, or fear of going outside of our comfort zone, is perfectly normal. But fear is often based on perception, some idea we have in the back of our minds. Even though most of those ideas are not based on reality, I still use them as leverage to do some risk-mitigation planning. I don’t shy away from asking myself the tough questions to see what the absolute worst is that could happen. It turns out that most risks can be avoided, and aside from a few exceptions, most decisions I make today can be reversed later on, if I decide to take on a different path. Life won’t fall apart if you take two weeks off. As a matter of fact it might actually improve. Sometimes those who wander off end up having the greatest adventures. So go on, explore. Allow yourself to book that trip to that one place you’ve always wanted to go. You deserve it. But you don’t really need me to tell you that – you need to believe it yourself. Travel often. Getting lost will help you find yourself. 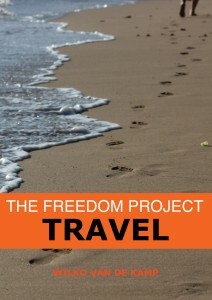 This post contains excerpts from my travel hacking book The Freedom Project. If this post interested you, why not get yourself a copy of this best selling travel book today? It’s widely available on Amazon, Barnes & Noble and even through finer brick-and-mortar bookstores worldwide. More details available at www.freedomprojectbook.com.